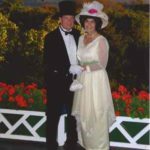 When we think of the Edwardian era, the romantics among us think of the 1981 movie, Somewhere in Time starring Jane Seymour and Christopher Reeve. 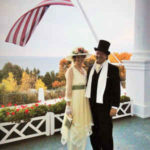 The movie was filmed on Mackinac Island, less than 100 miles from where we make Recollections fashions. We have a special affinity for the island and the era. 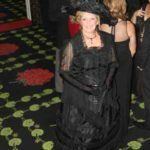 Women’s fashion changed a lot during the Edwardian era. 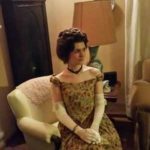 By the end of the era, the corsets of the Victorian era were pretty much a thing of the past. Designers celebrated the natural female form. Clothes flowed over a women’s curves in a way that hadn’t been seen in more than 100 years. 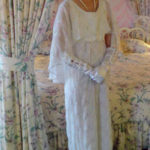 The clothes were as much a part of Somewhere in Time as were the actors and the Grand Hotel. Of course, the beautiful Jane Seymour only enhanced the beauty of the styles of the era. 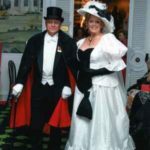 We were fortunate enough to present a live fashion show on Mackinac Island in 2014. 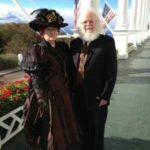 We’re so happy that you are willing to share your Somewhere in Time Weekend photos as well as photos of other Edwardian events! 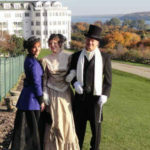 If you are interested in learning more about Mackinac Island’s Victorian era connection, we invite you to peruse our July 2016 blog about Mackinac Island the Gilded Age. Did you know that Maude Adams was the inspiration for Elise McKenna? 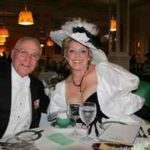 The author of the book first saw her photo in Nevada and became enamored with her. 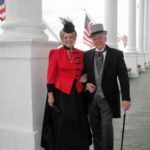 Find out more about Maude Adams and her connection to this cult classic in our August 2016 blog, Somewhere in Time, Still Inspiring Romance. One of our customers was kind enough to share her experience during the 2014 event. Titanic is another romantic movie set during the Edwardian era. Downton Abbey also spent a lot of time in the Edwardian era. In each instance, the clothes share center stage. Is it any wonder why? 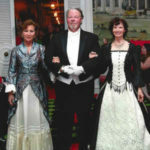 We want you to continue to share your Somewhere in Time Weekend and other Edwardian events with us through your photos. Please feel free to email them to us and we’ll add them to the gallery!